Masked gunmen on Monday briefly took over a European Union office to protest a Danish newspaper’s publication of cartoons deemed insulting to Islam’s Prophet Mohammad, the latest in a wave of violent denunciations of the caricatures across the Islamic world. The gunmen demanded an apology from Denmark and Norway, and said citizens of the two countries would be prevented from entering the Gaza Strip. 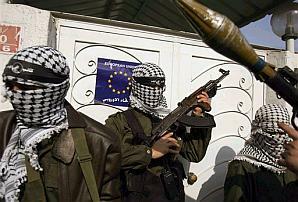 In the Monday incident, gunmen burst into the EU office, then withdrew several minutes later. A group of about 15 masked men, armed with hand grenades, automatic weapons and anti-tank launchers, remained outside, keeping the offices closed. No shots were fired, and there were no reports of injuries. Now, does this really sound like the type of place that Danes and Norwegians fancy? Please! In response to the constant hammering on Denmark, the European Union has warned Saudi Arabia that the bloc will take action at the World Trade Organisation if the Riyadh government supports a boycott of Danish goods. The Brussels Journal has more on the Viking’s expulsion.